LAST week, it was announced that five new beaches on the Costa del Sol have been awarded the prestigious Blue Flag status. This brings the total of Blue Flag beaches to 25, up from 24 in the previous year. One in every four beaches awarded the Blue Flag in Andalucia is on the Costa del Sol. Blue Flag beaches are recognised for their excellence in water quality, safety features and amenities, sustainability and accessibility. Spain now boasts a total of 591 Blue Flag beaches and 101 marina resorts distinguished with the prestigious Blue Flag award. 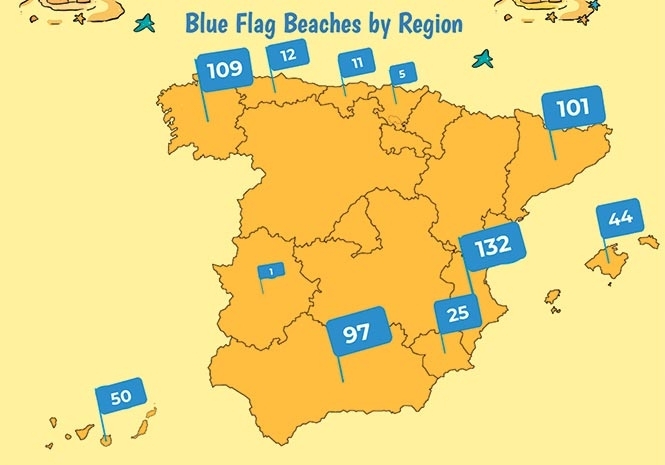 One in every six beaches in Spain is a Blue Flag beach and on a global scale, Spain tops the list of countries with the most number of Blue Flag beaches in the world for the 31st consecutive year. Beaches on the Costa del Sol to be newly awarded Blue Flag status are Playa Casablanca in Marbella, Arroyo Vaquero in Estepona, Los Alamos in Torremolinos, La Caleta Paseo in Velez-Malaga and, the municipality of Casares makes a first-time appearance on the list, with Playa Ancha. “Last year was a record-breaking year for tourism in Spain with over 80 million international visitors and beach holidays are in more demand than ever. “The Costa del Sol continues to be one of the most sought-after destinations for summer holidays, particularly with families who are attracted to the great weather, quality beaches and amenities on offer in the area,” adds David. Last year, Spain-Holid ay.com reached 63 million web visitors looking for a beach holiday rental [https://www.spain-holiday.com/Spain/holiday-rentals/beach], up 29 per cent on the previous year. Next articleUpdate on kangaroo spotting!